Breakfast is the most important meal of the day since your body is hungry after fasting all night long. When you eat a gluten-free diet, breakfast may seem to be a challenge with its fluffy pancakes, crispy waffles, and decadent cinnamon buns. You might be surprised to find out that many of these favorites can be made with a gluten-free recipe. Yet many other delicious recipes are made with ingredients that contain naturally gluten-free foods. You are sure to find several new recipes to fit your tastes, whether they are salty or sweet on any given day. Try several new ones and get the best of all these recipes have to offer. Whether you have an appetite for savory or sweet breakfast foods, there are many great gluten-free recipes to choose from. Since you likely don’t have much time to spend in your kitchen each morning, many of the above recipes quick and easy to prepare. There are some that are simple enough to make on busy weekday mornings and others can be prepared ahead of time and eaten the next morning without any flavor loss. Some even taste better the next day. There are a few, however, that are less nutritious or higher in sugar, and those are best saved for weekend or special occasion treats. Chickpeas and avocado are the main ingredients of this breakfast that takes only 10 minutes to prepare. The protein-rich chickpeas are quickly blended in a food processor with tahini, olive oil and spices to create this Mediterranean-style dip. The addition of avocado to this dip, hummus, adds a unique, but tasty, flavor to this mixture. The results are a creamy, gluten-free breakfast that is high in protein and monounsaturated fat. The finishing touch of this dish is a topping of cilantro and red pepper flakes. It can be served with tortilla or pita chips for a fun way to start the day. Imagine a bowl of egg salad that has no mayonnaise in it. Yes, it is possible, and it makes a delicious breakfast idea. The key to this recipe is to use an avocado, full of healthy monounsaturated fat, mashed to creamy goodness. Once the chopped hard boiled eggs are added to the mashed avocado, mayo is no longer needed since the egg salad is a perfectly luscious dish with a zesty flavor. This can be served on a gluten-free bread or wrapped in a large lettuce leaf for a protein rich breakfast that will keep you satisfied until lunchtime. For a breakfast with a bang, these shrimp tacos will surely wake you up and feed your body. While it may seem like an untraditional choice for the morning meal, these shrimp tacos just might change your mind. Lightly-fried, crispy shrimp are combined with the “firecracker sauce” for a spicy start to your day. They sit upon a bed of deliciously crunchy, tangy slaw in a light and fluffy Paleo-style tortilla. The sauce is the pivotal ingredient in this gluten-free recipe. It packs a punch with cayenne pepper, chili flakes, and sriracha sauce all combined with a few other ingredients to give this meal an authentic flavor. A colorful dish that will please your aesthetic side as well as your palate, these eggs are an easy recipe to prepare. The bright colors of the green pepper and red tomato are a stark contrast to the pale colors of the yellow and white egg. The combination provides you with a breakfast that is one of the great gluten-free recipes. It packs a wonderful source of protein with nutritious vegetables to get your morning off on the right foot. Each ingredient is added to the pan at just the right time, so it is perfectly cooked through. Since the egg is fried on top of the tomato and inside of the pepper ring, you will see all of the colorful goodness on your plate as you dig in. Hummus is a versatile and gluten-free food that it is a wonderful option for breakfast. Add in the sun dried tomatoes and basil of this recipe for an irresistibly fresh taste that you will want to make again and again. This easy-to-prepare hummus recipe beats any store-bought hummus in freshness and flavor hands down. In addition, it is the ideal choice for use as a dip or spread at your morning meal. Add some to a lettuce wrap with feta or as a dip for corn tortillas and enjoy this characteristically Mediterranean fare featuring chickpeas, tahini, basil, and sun dried tomatoes. Packed with so much flavor, you will not even miss the crust on this delicious quiche. Tomatoes are definitely the centerpiece of this gluten-free breakfast. Add in some basil, straight from the plant, and your meal will be bursting with the fresh flavors of an Italian kitchen. The Caprese style envelopes tomatoes, basil, and mozzarella cheese to create a recipe that will tickle the taste buds to the point where you will want to eat it again and again. Since it is full of vegetables, and the eggs are a great protein source, you don’t even have to feel guilty for doing so. When you are looking for a slightly more elaborate breakfast idea that is still easy to prepare, look no further than this decadent sweet potato hash. Simply prepared in one cast iron skillet, this breakfast is a perfect addition for those eating only a gluten-free diet. The sweet potatoes are cooked until tender and then combined with cooked, ground sausage, sautéed onions and rosemary. These ingredients produce a heavenly aroma throughout the house. To top it off and make it even more exciting, however, four eggs are cracked on top of the mixture, the skillet is popped into the oven, and it is all cooked to perfection. These lovely treats are baked in muffins tins and come out muffin shaped, but that’s where the resemblance to muffins ends. Still, they are a delectable and delicious part of a gluten-free diet. They are actually mini pies with a hash brown potato crust. The filling is a combination of eggs, peppers, bacon, and cheese. The combination actually resembles a mini quiche, but the green and red peppers make it look extra festive. They look good enough for a holiday brunch party, but they are easy enough for a quick weekday breakfast. When most people think of pizza for breakfast, they imagine the cold leftovers of last night’s dinner. This breakfast pizza is completely different. It is freshly prepared in under 30 minutes, chock full of healthy vegetables, and completely satisfying. It is just one more of the gluten-free recipes which also works for those living a Paleo lifestyle. With a sweet potato crust, some sausage, and your choice of your favorite fresh vegetable toppings, the taste is incredible. But, add eggs to the top for the added protein that will keep you energized all day long, and you have a brand new image of the perfect pizza. Cauliflower is substituted for wheat flour or potatoes to make this delightful dish part of your gluten-free diet. This individually portioned meal incorporates the vegetable with eggs and two types of cheese to make appropriate sized servings that will leave you anticipating the next time it will be on the menu. Yet, it is a filling breakfast option with its protein-packed eggs and cheese and its nutrient dense cauliflower. And the preparation of this dish is simple too. Most of the prep time is actual cooking time, so you can get other tasks done while you breathe in the wonderful aromas of your hash browns and cheese-y egg meal. Dress up those ordinary scrambled eggs with ingredients you probably have left over in the refrigerator. First, you need to grill a couple of tortillas, remembering that corn tortillas are a naturally gluten-free food. Once they are lightly crisp, set them aside, so you can sauté some peppers and bacon and scramble some eggs with cheese. Put it all together on top of one of the tortillas and cover with the other for a tasty new twist on breakfast. The bold flavors of the peppers will wake up the eggs for an experience that will get you going on any busy morning. This is one of the easiest gluten-free recipes to prepare. And, it is delicious, full of protein, and only contains five ingredients. The beauty is in the simplicity, and if you like a good fried egg, then this recipe is sure to please. A warm and crispy corn tortilla is topped with refried beans and melty cheese and topped with a perfectly fried egg. The egg can be runny or over-easy, depending on your individual tastes. Your favorite salsa completes the Mexican style breakfast entrée with a little spice. You can whip this up in less than ten minutes, and it is easily doubled if you are serving more than one person. This casserole is reminiscent of a Monte Cristo sandwich which typically includes ham and cheese on bread that is then fried in French toast batter. Yet, this easy recipe is gluten-free and very low in carbohydrates. The secret is the use of homemade cream cheese pancakes instead of bread. Layered with Canadian bacon and cheese, lasagna-style, you get layers of pancake, ham, and cheese in every bite. You can also choose to add maple syrup which soaks into the layers for a finished product that is both sweet and salty. And, for an even more elaborate meal, a poached or fried egg can be placed on top and eaten with the layers of casserole. A colorful breakfast idea, this burrito will wake up all of your senses. Red and green bell peppers, along with chopped avocado, look so pretty when cooked together with the yellow scrambled eggs, and the emerging scent is just as blissful. Wrapped together in a gluten-free tortilla and topped with your favorite salsa, the taste does not disappoint either. It’s satisfying enough to wake you up on the groggiest of mornings, and this burrito is sure to leave you feeling satiated for hours after eating. Hummus is a delicious addition to this Tuscan style breakfast wrap. Gently warmed and spread on a gluten-free tortilla, It adds a Mediterranean flair and a burst of extraordinary flavor. Topped with a mixture of scrambled eggs that have been combined with sun dried tomatoes, chopped basil, and mozzarella cheese, it is then rolled, burrito-style, into a perfect packet of goodness. Its many flavors meld together for a taste that is fresh, bold, and cheesy enough for any appetite. You can tweak this gluten-free recipe by changing the type of cheese or adding some veggies for an even more robust meal. These breakfast nachos pack a lot of delicious ingredients into them for a nutritious, energy-filled start to your day. Despite this fact, they are still one of the easier gluten-free recipes you can prepare. While nachos typically have a tortilla chip base, these breakfast nachos have a hash brown base that can be created in a waffle iron. Browned and crispy, the hash brown waffles are then topped with an enticing tofu scramble that contains nutritional yeast, turmeric, and other spices for a unique, full-bodied flavor. Additionally, this is topped by colorful peppers, black beans, and tomatoes for an eye-appealing climax. At first glance, you will find it hard to believe that these beautiful cinnamon buns are a gluten-free food. And, once you take your first taste of them, the amazing texture and melded flavors will surprise you even more. Using a gluten-free bread flour, these morning buns will rival any that you can find in a Starbucks bakery case. The soft and tender yeast dough is filled with brown sugar and cinnamon and baked to perfection. It is then topped with a vanilla cream cheese icing that completes the decadent creation. You may be wondering what cloud bread is and how it can only have four ingredients. It is a fluffy, light bread substitute that is versatile and virtually carb-free. The main ingredients include eggs, cream cheese, and baking powder. That’s it. However, this is a gluten-free recipe that you can customize by adding a variety of herbs and spices to suit your tastes. Moreover, you can top it with spreads, add sandwich fillings or simply use it as a hamburger bun. No matter how you choose to eat it, you can do so guilt-free as it will meet nutritional needs. 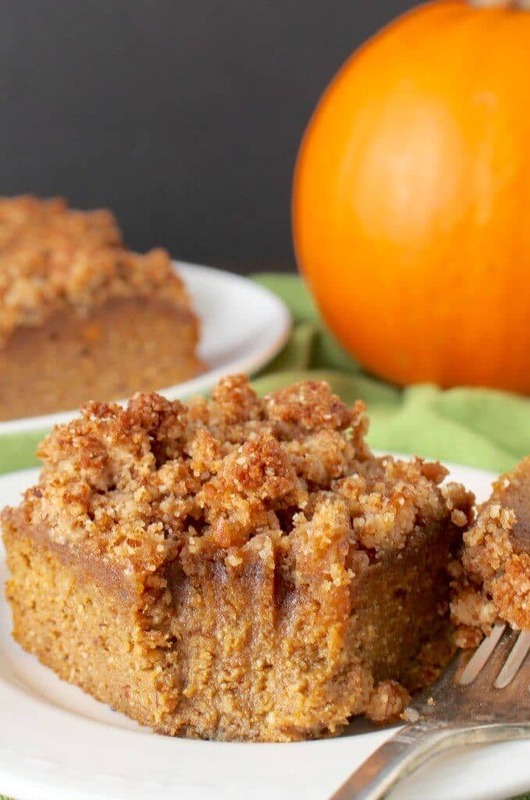 The perfect fall coffee cake is Paleo-friendly and full of nutritional pumpkin puree. In addition, using a combination of almond flour and coconut flour in place of regular wheat flour, this cake looks and tastes just like regular cake even though it is gluten-free. Plus, your kitchen will smell so good when it is baking because the coffee cake contains cinnamon and pumpkin pie spices. The crumb topping is sweet and the perfect adornment for this special treat. This can be served for breakfast as it is chock-full of healthy ingredients to start your day. With only eggs and a banana, you can make a moist, flavorful pancake that the whole family will love. Based on these two simple ingredients, the resulting pancakes are naturally gluten-free. And, how many gluten-free recipes are this easy to prepare? These flavorful pancakes can be served plain, with syrup or another spread such as peanut butter or jam, or both. The blender makes quick work to create the smooth batter that cooks up quickly, and you can make any sized pancake your family enjoys. This cake is full of blueberries but actually contains no flour making it one of the gluten-free recipes you can prepare for breakfast. Instead of flour, it contains rolled oats that are ground into a powdery form. This creates a cake that is light and fluffy on the inside and tender on the outside. In addition, it is baked as a two layer cake, all in one pan. The bottom layer is mostly blueberries with some of the cake batter mixture while the top layer is exclusively cake. While you can enjoy this for breakfast, it is good enough to serve as a dessert for company, especially when you add some vanilla ice cream. When you strive to eat only a gluten-free diet, it is hard to imagine how brownies can play a role. Nonetheless, these brownies not only fit the bill, but they are rich, dense, and decadent. Since they are full of fruit and protein, they actually are an awesome breakfast idea for those who love chocolate. Specifically, when served chilled, these protein brownies are extremely fudgy and dense though they are not super sweet. They will satisfy your chocolate cravings and your appetite at the same time, keeping you energized with their protein punch. Sometimes you need a quick, gluten-free breakfast and your caffeine to get you going in the morning. This chocolate chip mocha smoothie contains both in one easy recipe. Greek yogurt provides the protein for energy, and bold coffee adds flavor and caffeine. Plus, there are two sources of chocolate: chocolate chips and chocolate syrup, to satisfy your sweet tooth. Some may even choose to throw a ripe banana into the blender to add a bit of fruit to the mix, but it is optional. Once this frozen drink is topped with whipped cream and another drizzle of chocolate syrup, you will think you just stepped out of a fancy coffee shop. Blueberry pancakes are a nice way to start the day. When you use only gluten-free recipes, it may be a challenge, but not any more. These pancakes use oatmeal as a base, and yogurt, egg, and banana for texture, flavor, and protein. The addition of the bananas almost make you think you are eating banana bread. Since all of the ingredients are combined in a blender or food processor, the preparation is simple. Cooked in a pan just like regular pancakes, with the addition of blueberries on top, these pancakes really satisfy your hunger in the morning. Super soft muffins full of dense, fudgy goodness are the perfect gluten-free breakfast for chocolate lovers. These delicious muffins take only five minutes to prepare, and then your kitchen will smell heavenly as they bake for 20 minutes. It will be hard to wait until they are cooled to dig into them. The best part about these muffins is that they are actually good for you. They contain no grains, refined sugars, oils or dairy, and they are full of vegetables and fruits plus eggs and nut butter for protein. You can indulge in these chocolately zucchini muffins for a healthy breakfast or snack. These muffins celebrate the best of the bakery cinnamon roll with the added ease of preparing muffins. Best of all, they are gluten-free. The light and flaky cake portion is highlighted by a cinnamon and sugar filling. Since the filling is swirled in the middle of the muffin and on the muffin top, the experience is heavenly cinnamon sugar goodness. The aroma wafting from your kitchen as these are cooking is decadent. And then, the muffins are then topped with a vanilla glaze while still warm for just a little bit of extra sweetness. Gluten-free banana pancakes are a special treat any day of the week. When they are super simple to prepare it is an added bonus for a busy morning. With chunks of banana and a very light texture, these banana pancakes will hit the spot. This gluten-free recipe yields lovely silver dollar sized mini pancakes that are perfect for stacking. Layer some butter between the pancakes and drizzle maple syrup for a finishing touch. The fruit and eggs combine to give you the nutrients your body needs and the protein that will keep you full until lunchtime. This thick and creamy oatmeal tastes just like cinnamon roll batter from a famous cinnamon bun chain store, but it is gluten-free, dairy-free, and low in sugar. And, when you taste it, you will have the non-guilty pleasure of its awesome flavor and consistency. This easy recipe can be prepared on cold mornings for a hearty breakfast that is quick and healthy. It can even be made the night before and eaten cold or re-heated in the morning. So good you’ll be tempted to eat it for dessert, the non-dairy milk in the recipe is the key to making this oatmeal extra luscious. And, since the icing is made mainly from protein powder, it gives the dish a little extra pop to start your day. Cake for breakfast may not seem to be the everyday choice, but with this healthy, flourless lemon poppy seed breakfast cake, it can be. Light and fluffy cake with a subtle tang from the lemon, this cake can be part of a gluten-free diet. The addition of poppy seeds and lemon zest really take this recipe over the top. The choice between three different types of frosting gives this cake a bit of versatility, but all of them work to add a sweet topping. This beautifully tender cake is a great addition to any breakfast repertoire. Start your morning with strawberry oatmeal bars, made with homemade strawberry jam. It’s not nearly as difficult as it sounds. Since pure rolled oats are a naturally gluten-free food, you can use them in place of wheat flour for these scrumptious bars. Half of the oats are ground in a blender to make them a flour consistency while the other half are left to give the bars some chewy texture. Mashed banana is the key to making the crust soft without any added sugars or oils. The homemade strawberry jam comes together quickly with a bit of maple syrup and some chia seeds. However, if you don’t like strawberry or want to make this recipe even easier, you can use store-bought jam in any flavor and still achieve extraordinary results. This muffin batter blends up quickly in a food processor. The muffins themselves have a delicate pumpkin flavor with maple syrup and chocolate chips for an added sweetness. Yet, the moist, dense texture makes these delights a satisfying breakfast for any day of the week. Additionally, the cinnamon makes for an irresistible aroma in your kitchen when they are baking. It may be hard to wait until they come out of the oven. If they do last, they store beautifully in an air-tight container in the refrigerator for up to three days. The perfect breakfast-on-the-go, these pumpkin cookies can be prepared ahead of time for busy mornings. With a pumpkin flavor that shines through, these cookies are chock full of nutritional goodness including pumpkin seeds, flax seeds, and dried cranberries. Not only do they pack protein and vitamins into the cookies, they also give it the perfect crunch and sweetness. Additionally, two types of oatmeal give these cookies a texture that is not too dense but still holds together well. While cookies for breakfast may sound counter-intuitive, these are a great breakfast idea. Buttermilk biscuits can be a comfort food to some, but when following a strictly gluten-free diet, they would seem to be off limits. With the use of gluten-free Bisquick, however, they can now be back on the menu. Prepared with buttermilk in a similar manner as regular biscuits, these gems are fluffy and delicious. You can serve them with gravy or with butter and jam, or any other way you desire. This is not your ordinary breakfast cake, but rather one that is full of fruit so you can feel good about eating it. Not only that, but this cake is tender and moist and so delicious you won’t believe that it is made from a gluten-free recipe. It uses gluten-free flour, among other ingredients, and ricotta cheese is the key to helping it not taste all dried out. Raspberries are mixed right into the batter and more raspberries are placed on top. The recipe also suggests that you can use a variety of other berries such as strawberries or blueberries or maybe even a combination of all for a delicious breakfast treat. Waffles are another food that many who use only gluten-free recipes do not expect to eat. These waffles, however, may change some minds. Cooked to a golden brown and eaten hot, these waffles have a dense texture just like regular waffles. They are perfect when paired with real maple syrup or fruit and whipped cream or any topping of your choice. The healthy fats and protein sources that to make up these waffles will even keep you full until lunch. Heavenly when warm, these apple fritters are also quite tasty the next day, if any last that long. The batter’s main ingredient is rice flour and the addition of chopped apples makes these fritters deliciously sweet. Since these are fried in a similar manner to donuts, they are not necessarily health food, but a decadent, gluten-free breakfast treat. These beauties come out in a variety of shapes, but no matter, they are all tender and tasty. Once the vanilla glaze is poured over them, they are extraordinary. It is hard to find a gluten-free recipes for bagels that are also egg free. This recipe does just that, and the results taste amazingly like regular bagels. The secrets to making bagels are not to allow to much rising time, to boil only a short time, and to get them right into the hot oven after boiling. These bagels satisfy the craving for bread while remaining a part of the gluten-free diet. They can be topped with a number of flavorful toppings or mix ins such as cinnamon and raisins for a different twist. They can be sliced and eaten with cream cheese or any sandwich filling of your choice. A seasonal twist on a classic, these moist, fluffy, and delicious pumpkin pancakes are a great weekend breakfast. They are so sweet and flavorful that they don’t need any special adornments, however, they would go well with sliced banana and some maple syrup for those who choose to add it. This is an easy recipe to prepare in your kitchen as you simply mix the ingredients and cook in a frying pan. Flipping is simpler when they are made small, and this just means that you can eat more of them. Sometimes you just want to eat unbaked cookie dough and since this dough has no eggs, it is suggested that you do just that. It has the taste and texture of real cookie dough with the added benefit of being gluten-free food. And, it’s healthy, too. It contains protein from protein powder as well as healthy fats and slow digesting carbohydrates. Another great benefit is that it takes only five minutes and one bowl to prepare. You can eat it overnight or let it chill in the refrigerator overnight for an even better texture. Baked oatmeal is the perfect on-the-go breakfast. You can make these the day before and just grab one in the morning for a quick and nutritious breakfast. Baked oatmeal is delicious and versatile with many add-in options such as peanut butter and chocolate chips for a treat, cinnamon, apples, and walnuts for fall, and many other options. Plus, these include lots of zucchini, so there is a serving of green vegetable that works overtime giving moisture and richness to these individual serving oatmeal cups. Ripe, or even slightly overripe, bananas just scream out to be made into banana bread. And, this banana bread can be made a day ahead to achieve an effortless morning. This fabulous bread is an appealing breakfast idea for its ease and tempting flavor. Even if you eat a gluten-free diet, you can still make this quick bread. Simply substitute regular flour for gluten-free flour in this easy recipe. You will find it creates a tender, slightly sweet result. The banana and applesauce both help to keep the bread moist and thus scrumptious. This gluten-free recipe for cinnamon rolls is so good that you will never know that they aren’t the real thing. The recipe is simple though the preparation is a bit time consuming, so you will probably want to prepare these for special occasions or weekend treats. The rolls do come out soft, sweet, and gooey when a blend of gluten-free flour is combined with yeast and several other common bread dough ingredients. And, the filling is full of butter, sugar, and cinnamon that leaves your kitchen smelling absolutely delectable while baking. The cream cheese icing is a sweet, rich topping that finish these off beautifully. These gluten-free biscuits appear to be typical biscuits made with wheat flour, but they are not. For those that need gluten-free recipes, this one suggests using a white rice gluten-free all purpose flour to create light and flaky biscuits. They are easy to make and come together quickly. They are best served fresh out of the oven, but can be re-warmed by wrapping in foil and placing in the oven for a short period if they have been made ahead. They are buttery and delicious plain or with a spread. They have a slightly crispy bottom with a soft top and middle. They are the perfect comfort food and make a nice breakfast. These crispy, browned fritters contain some very different, but delicious, breakfast ingredients. Tasty spaghetti squash is baked until soft and combined with bacon, eggs, and Parmesan cheese to make a batter. Spoonful of batter are dropped into hot oil and then lightly fried until the outside is slightly crunchy. The center is still tender, moist and full of flavor. The bacon really shines in this gluten-free recipe, so bacon fans will rejoice. Additionally, this easy recipe does not require a lot of skill in the kitchen, so even beginner chefs do not have to feel intimidated in creating this fancy menu item. These muffins are a combination of two popular gluten-free flours including oatmeal and almond flours. The two together mix with mashed banana and other ingredients to make a very moist and delicious muffin. The banana aroma is amazing when these are baking in the oven. The addition of chocolate chips not only adds extra sweetness, but also makes the muffins fun and perfect for chocolate lovers. Using dairy-free chips keeps these muffins vegan. Since all of the individual ingredients used are vegan and gluten-free foods, these muffins are perfect for a variety of diets. These hearty breakfast cookies will tame your hunger and can be ready in as little as 20 minutes for a quick morning meal. Yes, cookies can be good for breakfast. These gluten-free cookies contain no flour, no butter, and no oil, but yet they are delicious. Creamy peanut butter and oats are the main ingredients that work together to make this recipe a hit. They are just the right texture with a bit of crunch on the outside and perfectly chewy on the inside. The chocolate chips satisfy any chocolate craving you may have. These bars are a great choice for breakfast on-the-go or take-along snacks The name is inspired by the trails the author likes to hike and ski since she always takes these bars along. They are gluten-free and made with nutritious whole foods that are easy to find in any grocery store. Additionally, they are customizable since you can change the types of nuts and nut butter and add or subtract dried fruits of your liking and still achieve a fabulous result. They have a crunchy texture that is full of protein to satisfy and keep you going until the next meal. This bread bakes up to become a springy, hearty bread full of oats, bananas, and other simply good ingredients. Topped with extra whole oats, you will find a delicately chewy exterior crust and tender interior. The banana flavor of this bread is mild, but tasty, and it provides just the right amount of moisture to make this bread a perfect breakfast choice. In addition, this recipe is easy to make, vegan, and gluten-free food, so it will appeal to a wide variety of people. Whenever you can mix a batter directly in a blender, it is almost certainly an easy recipe with limited dishes to wash. Better still, this particular recipe is delicious and full of good ingredients to make a delicious, nutritious breakfast for your gluten-free diet. The wholesome ingredients that make up this recipe include bananas and Greek yogurt along with rolled oats. These options make a moist and tender muffin that has a delightfully crispy top. To make these your own creation, you can customize them with a variety of mix-in choices to suit your tastes. Anything including chocolate chips, fresh or dried fruits, or chopped nuts can create a unique muffin every time. This light and fluffy bread is chock full of apple goodness. Perfect for fall weather, this bread uses all-purpose gluten-free flour mixture to render it gluten-free and omits eggs and milk for the vegan option. The dough is actually easy to work with and the end result is so moist and soft that some may find it hard to believe that it is not a regular bread. Additionally, the glaze on top of the bread adds to the sweet cinnamon and sugar apple filling to make this a very sweet choice for your autumn morning breakfast. You are sure to be able to add some new excitement to your breakfast repertoire with the many recipe choices. They can help alleviate problem of boring breakfasts so you don’t feel like the morning meal is a burden. Better yet, many of the gluten-free recipe choices are healthy and nutritious and will satisfy your hunger until lunchtime.